More reasons why owning gold and silver should be at the top of everyone’s financial survival list, current elite-abused [abandoned] supply/demand considerations aside not being a part of the reasons where reason is utterly absent. Politicians have run amok. The elites are driving world economies harder and faster into the ground. Lies are the current political and financial currency, and the public seem not to mind. From the Washington Post: 9 charts showing Yes-We-Can-Obama’s “recovery.” The 1st, 3rd, and 4th charts show debt of the American people [remember the 14th Amendment: the federal debt cannot be challenged – the elites had that written in]; the 2nd shows the ‘growth” of those reliant on the public teat, [in large, thanks to the preceding chart and the ones that follow]; the 5th shows Yes-We-Can Obama’s force-fed healthcare solution that nobody except him and the elites wanted, and why debt-enslavement is ensured, forcing yet more Americans onto chart 2; charts 6, 8, and 9 show Yes-We-Can-Obama’s “healthy economy,” if anyone is sufficiently retarded gullible enough to believe his lies. Chart 7 is a mystery. 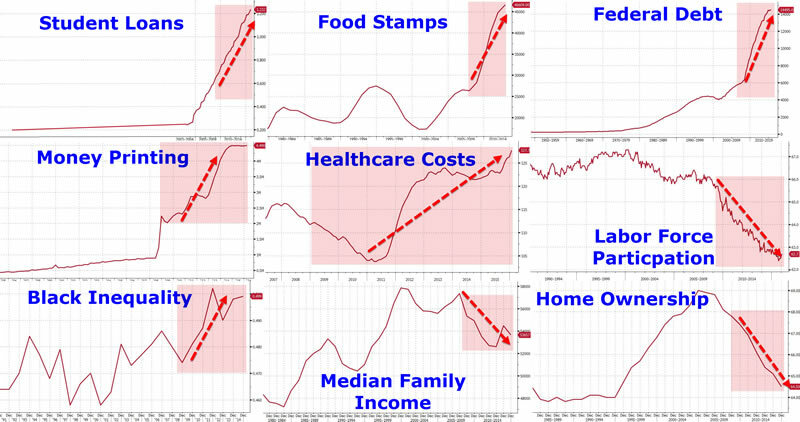 Insert any color vs the federal government, and you would get the same chart, maybe even worse. Do you know who are relatively impervious to these charts? Owners of physical gold and silver. Well, no one escapes the negative repercussions of an out-of-control-corporate- federal-government, but those who own precious metals are in a much better position to not be swallowed up by the tsunami-proportion of debt burdening the public, world-wide, not just Americans. The wealth preservation effect would be exemplified in owning PMs. We suspect these charts are interchangeable with the EU, as well. Given how the unelected bureaucrats have buried the EU countries in debt, and now even more costly immigrant issues, EU charts would actually be worse. Not only should the Brits be rushing toward BREXIT, [the biggest reason being that all of the corrupt politicians are for it], every former sovereign European nation should be doing the same. Otherwise, its is Greece for all! Count on it. 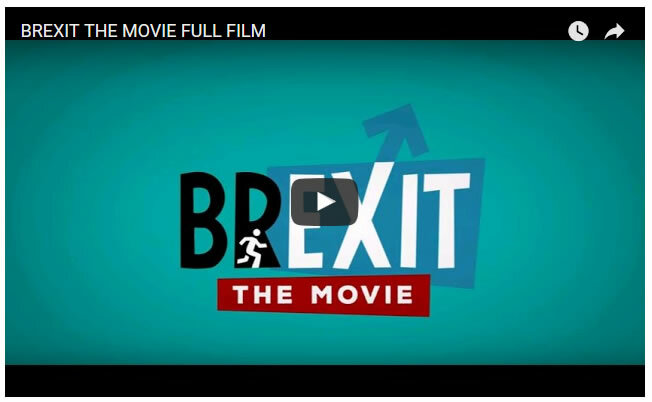 Here is an hour-long video on BREXIT that anyone from Britain that plans to vote should view, and the first 10 minutes may suffice. Basically, it is every man/woman for themselves. Those who own and physically hold gold and silver are somewhat financially independent from all forms of government, which has been why all governments [except China] want to keep gold out of the hands of the public. For anyone foolish enough to keep any of their money in a bank, those funds are no longer yours. That money belongs to the bank, and you are a bottom-tier creditor, last in line to be paid in the event of a bank failure, and they will be forthcoming. Gold and silver have no counter-party risk that is subject to bail-ins and basic government theft, calling it what it is. Price is irrelevant, at this point, for owning and holding gold and silver, as we have been diligently advocating for the past three years. The only relevant factor is having it. If not, well, those who do not are probably not reading this article. Friday could well be the game-changer so many have been anticipating. 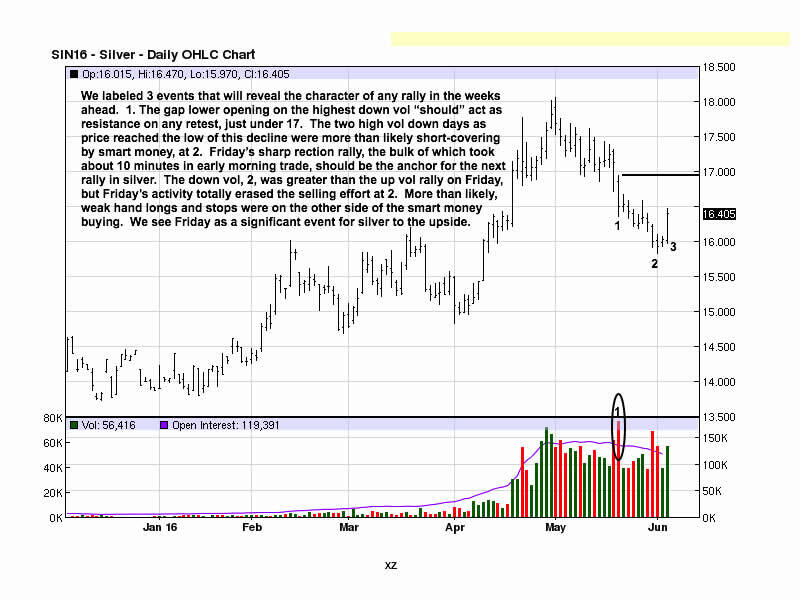 Everything in developing market activity has to fit into a context, and our read for gold and silver has been guardedly bullish. Friday may have been the final trigger to resume the rally from last November and confirm a bottom is in. It is important to have synergy in the time frames to ensure market activity is wholly in unison and direction, for that is what a trend requires. If the assessment is on target, the last 4 months of sideways action has created a base from which a launch into higher prices has enough “energy” to eventually attack the 2011 highs. There is no timetable, should this prove to be the case, but it seems that events are happening at faster speeds, the rise in PMs being the only exception. What we know for certain is that the neocons running this country [into the ground] will not give up and will risk war with Russia to divert attention from the US economic failures, and glaring ones, at that. Anyone that follows the market’s lead had good reason to follow along in that rally. 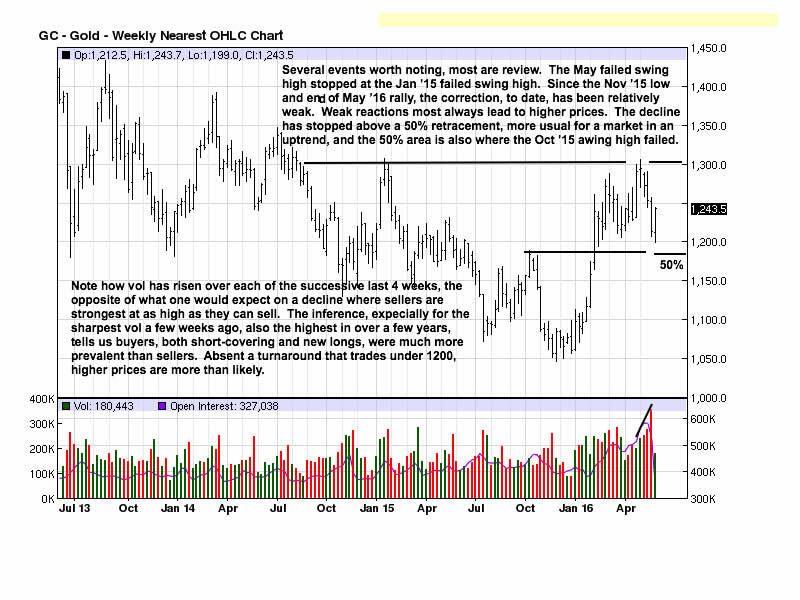 Smart money does not like company, and the size and quickness of the rally may have scared off many from jumping in. Follow-through next week should not fizzle, otherwise, it could lead to more PMs disappointment. An Axis Line is one that once was previous support, as seen on the left side of the chart, and the same price level become resistance in future retests. It does not pay to get too far ahead of events, so we take developments one week at a time, sometimes even a day at a time. One will not miss any move any the process, so patience has merit. Given events as they are, as of last week, with continuation next week the Axis Line is not a viable target. When we say the “character” of a market’s move, we mean the quality of developing market activity. 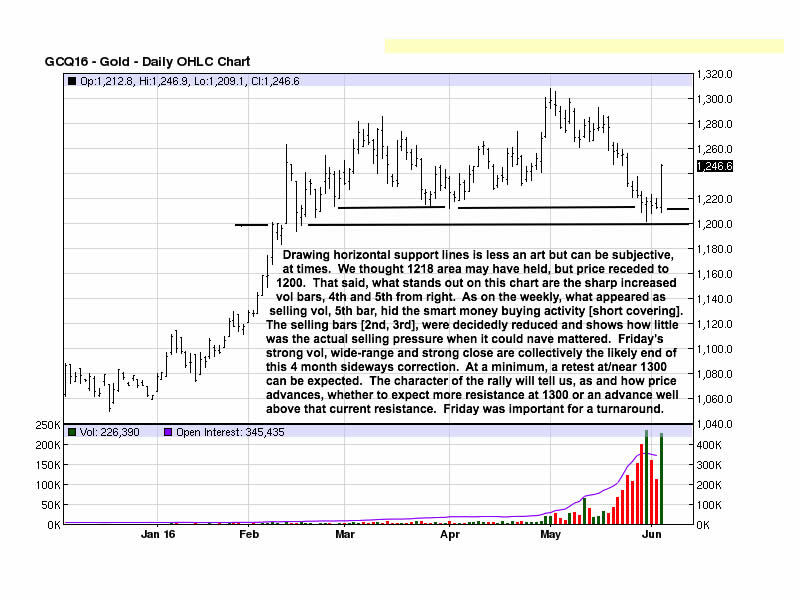 In an up move, one looks for wider ranges, upper end closes, all on increasing volume. 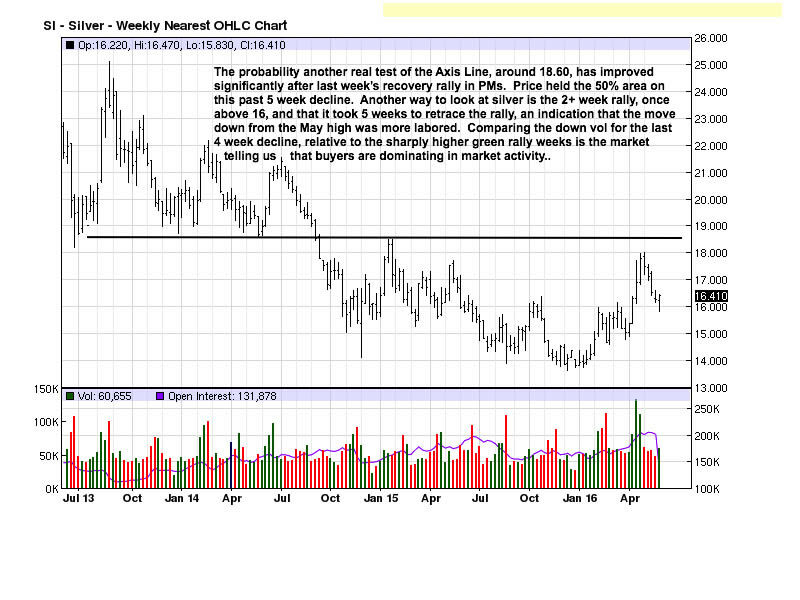 On the days of correction, ranges tend to be smaller and volume reduces, sometimes considerably. How price responds to Friday’s potential turnaround rally will be an important tell, and the market will provide all of the information needed to make the necessary analysis and take the appropriate action. Friday’s impressive rally screamed Buy! Now we get to see if the market will deliver on its message of apparent strength.